Welcome to Rochester Business Journal NewsLink, the nation’s first electronic multimedia business newspaper. NewsLink employs state-of-the-art multimedia technology — developed by our partner in this venture, Rochester’s WalkSoft Corp. — to bring you the award-winning news, profiles, special reports, marketplace data and full-color photographs found in each newsprint edition of the Business Journal. But it also offers additional features and photos — that’s why we describe it as the best of the Business Journal…and more. What are some of these extras? One is more color photographs such as those found in the Page One and Profile sections of this sample issue, and the Picture of the Week. Another is the Database section. This department will expand in the coming weeks and months to include a range of vital business and economic information. And you will be able to access it in each issue with the click of the mouse. The most significant difference between the electronic and print editions of the Business Journal, of course, is NewsLink’s technology. Using this technology you can increase your productivity, keep up on Rochester’s business news while on the road and find what you want to know with remarkable speed. The Search function — located in the Edit pull-down menu — enables you to find articles and features on any individual, company or subject within seconds. Once you are a subscriber, you will be able in a single search to comb through one, several or even all of the issues downloaded to your hard drive. What until now has taken from minutes to hours to locate is within your grasp almost instantly. NewsLink is very much a work in progress. You can play an important role in shaping its development by letting us know what you think of the electronic edition and what features and information you would like us to add. Use the Reply to the Editor message pad on the next page. 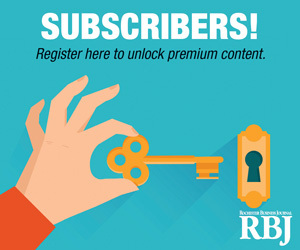 Or call, write, fax or contact us via e-mail at RBJournal@aol.com. We had an idea; NewsLink is the result. Now it’s your turn.